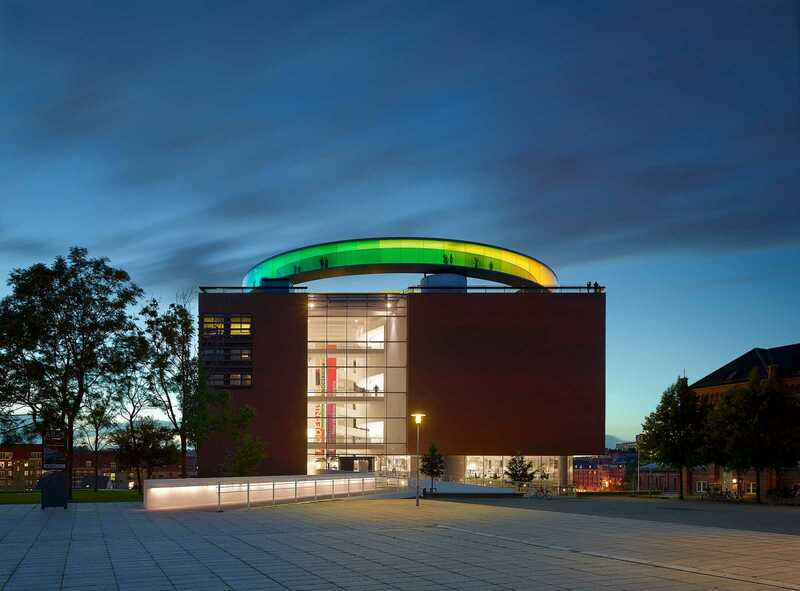 “Your Rainbow Panorama” is a circular, panoramic walkway in all the colors of the spectrum, constructed on the roof top of ARoS Museum in Aarhus, Denmark, designed by the architect Schmidt Hammer Lassen. 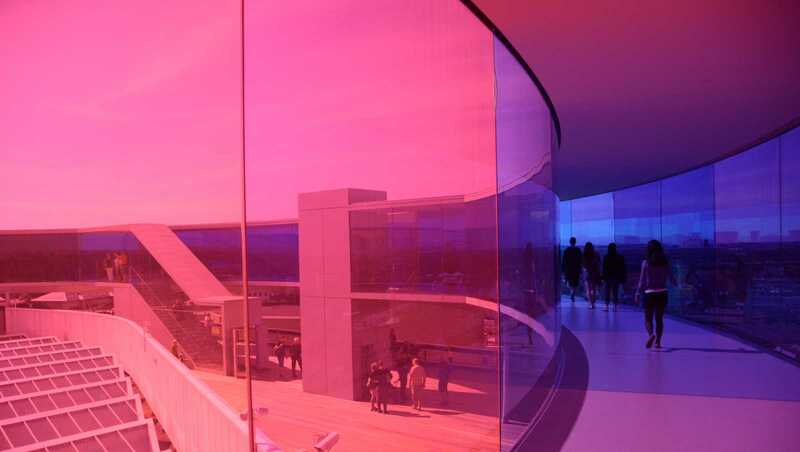 The ARoS building was inspired by Dante’s “Divine Comedy,” the nine circles of Hell and the journey up from the mountain of Purgatory, ending in perfection in Paradise. 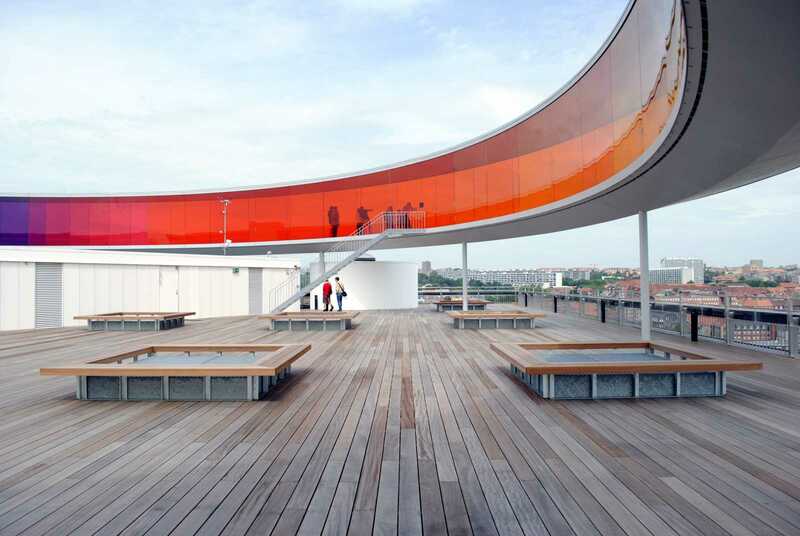 The permanent installation of “Your rainbow panorama” on the roof represents the completion of the building’s idea. 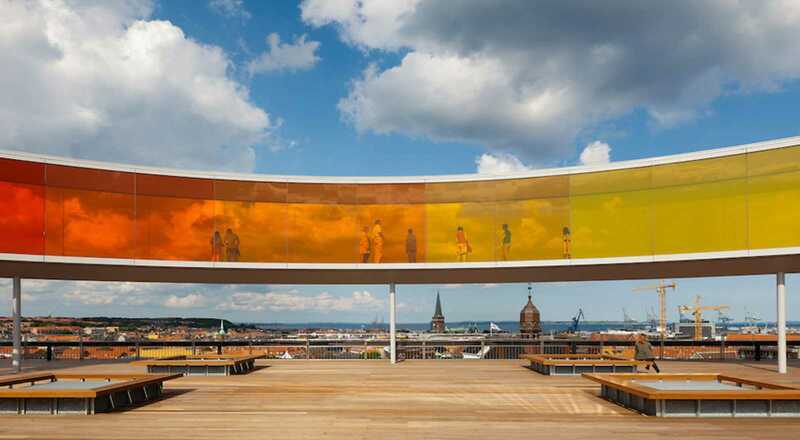 “Your rainbow panorama enters into a dialogue with the existing architecture and reinforces what is assured beforehand, that is to say the view of the city. I have created a space which virtually erases the boundaries between inside and outside – where people become a little uncertain as to whether they have stepped into a work or into part of the museum. 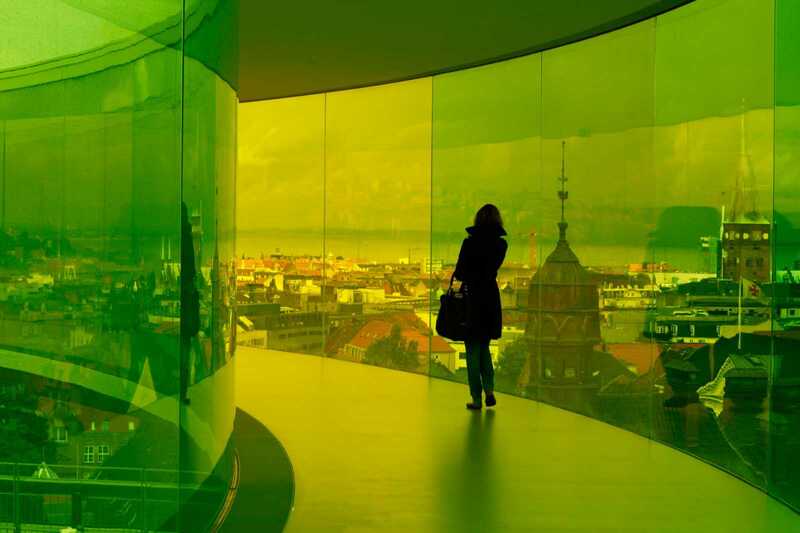 This uncertainty is important to me, as it encourages people to think and sense beyond the limits within which they are accustomed to moving” says Olafur Eliasson. 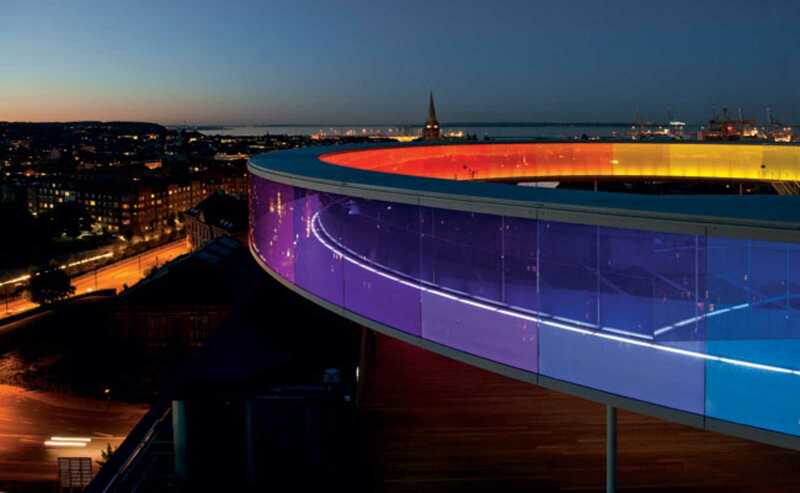 The realization of this unique rooftop project has been made possible through a partnership between ARoS, the Municipality of Aarhus and Realdania, in that Realdania are financing the establishment of Your rainbow panorama. 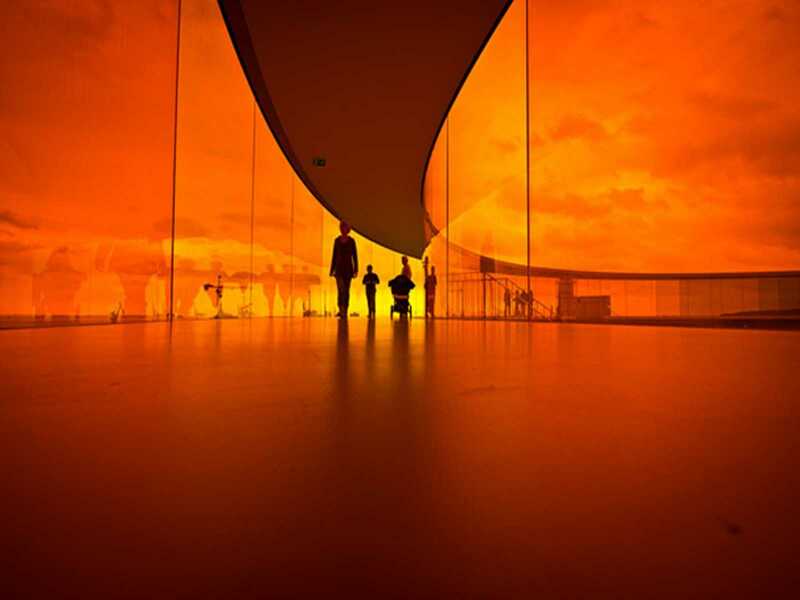 Olafur Eliasson has created this permanent work of art in the form of a circular walkway 150 metres in extent. The spectacular work of art has a diameter of 52 metres and is mounted on slender columns 3.5 metres above the roof surface of the museum. Visitors to the museum can walk into to this great work of art via stairs and lifts. 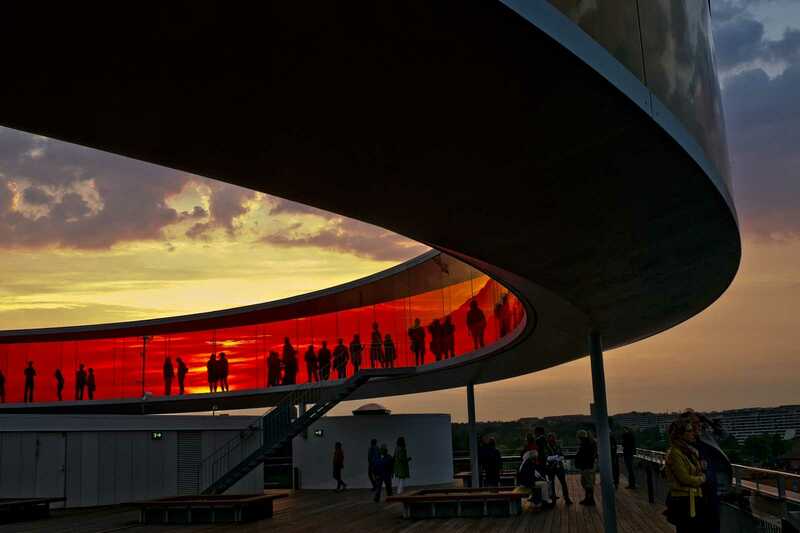 They can take a stroll such as will delight the senses round this circular pathway, which will provide them with panoramic views of the surrounding city and Århus Bay. 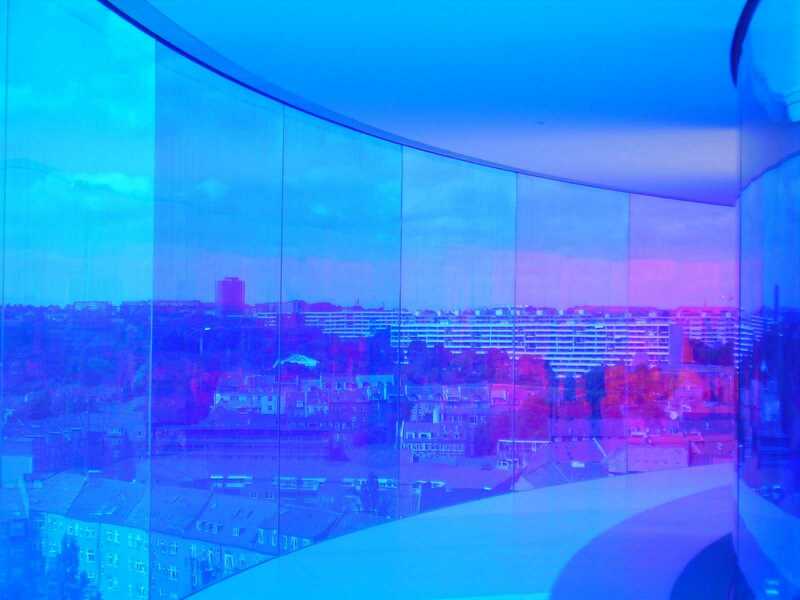 At 3m in width, the passageway is wide enough for a number of people to pass through easily and is designed to act as a visual compass for the city of Århus, affording incredible panoramic views across the neighbourhood. 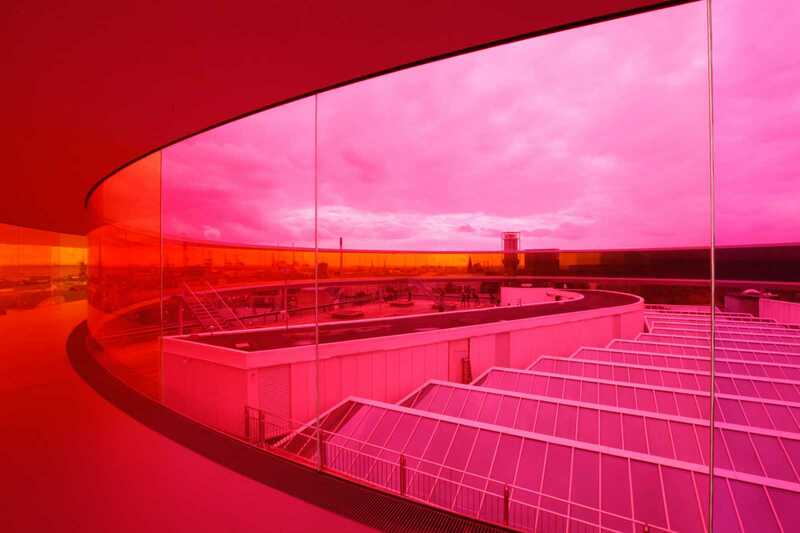 This work is typical of the artist, whose previous architectural designs act as contemplative pieces that analyse the relationship between body and environment. 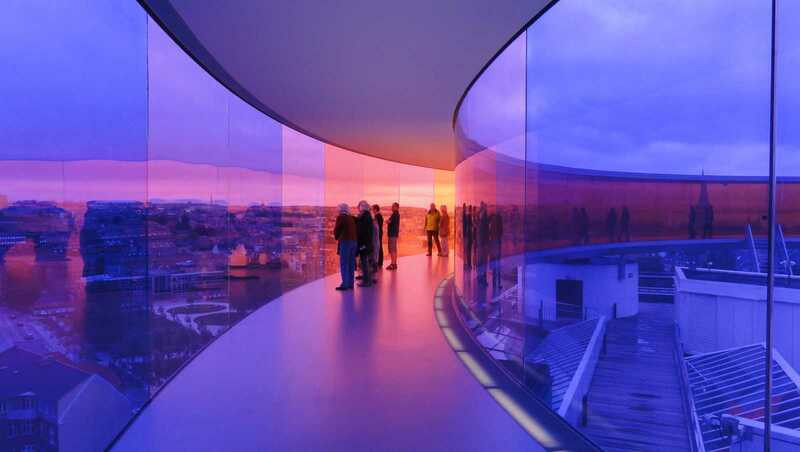 The glass in “Your rainbow panorama” consists of 2 x 12 mm laminated glass composed of up to 6 colored sheets creating the individual shades. For the sake of personal safety, the two layers of glass have been heat-reinforced and laminated together around the colored sheets. 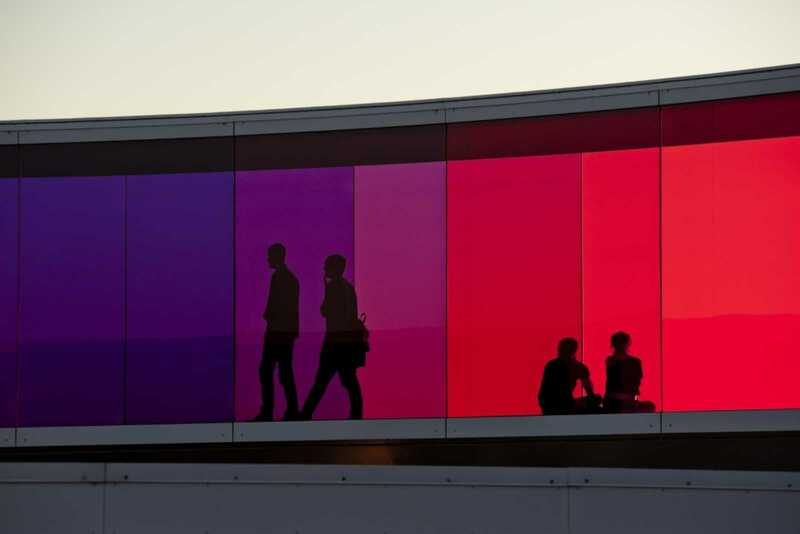 Beneath the “floating” work of art the 1,500 square meter roof surface is covered with sturdy timber, making the roof a unique recreational area and viewing platform some fifty meters about street level. 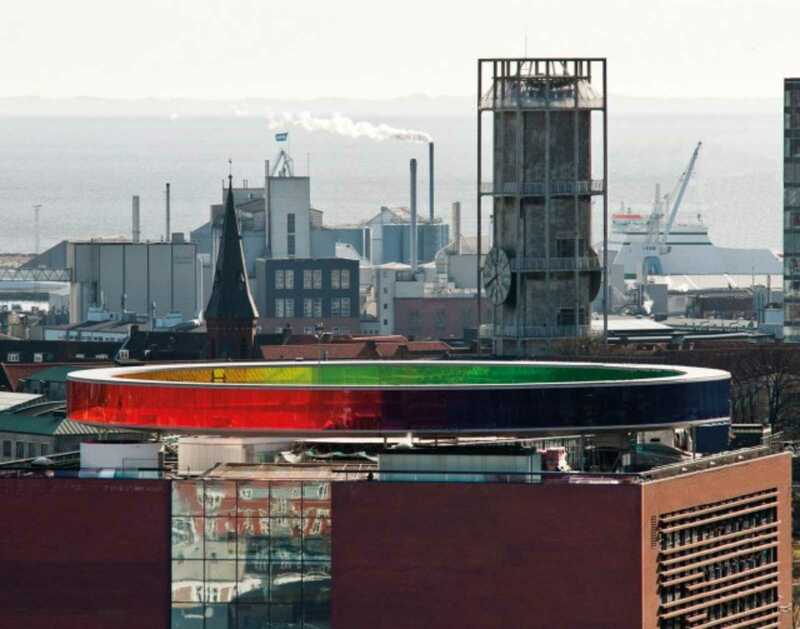 “The project complies in a brilliant way with the competition’s aim to convert ARoS’ rooftop surface to a unique artistic and architectural sight of international stature. During the hours of darkness is illuminated by means of lamps in the floor. 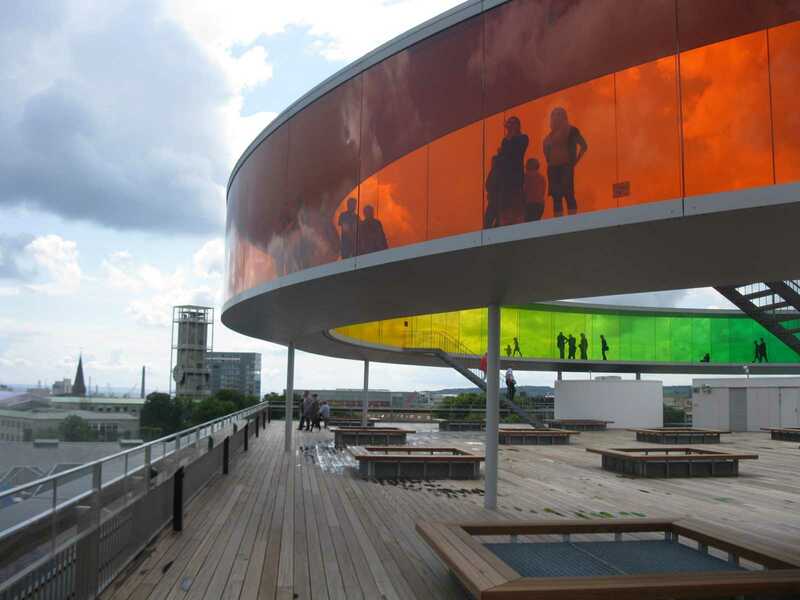 There is space for 290 visitors at one time on the roof terrace, and 150 in “Your rainbow panorama.” The work has cost 60 million kroner and has been financed by Realdania, while the cost of the roof terrace has been borne by Købmand Herman Sallings Fond. 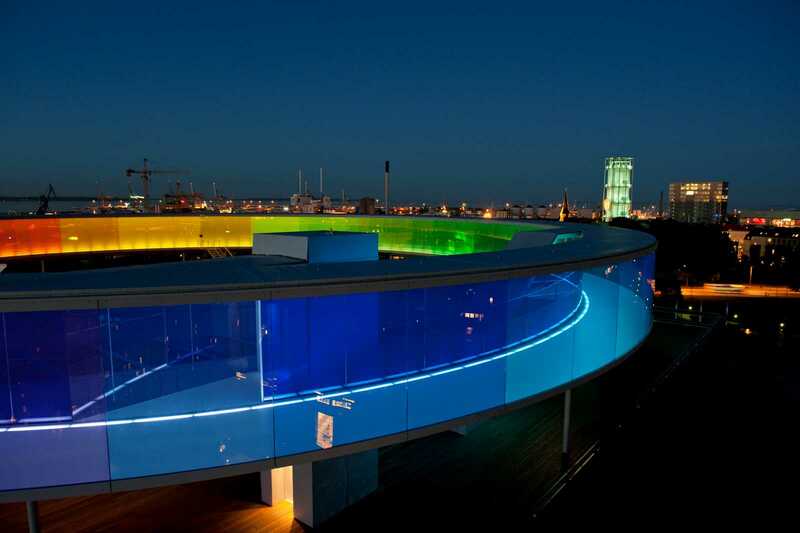 Aarhus Municipality is the authority responsible for the project.